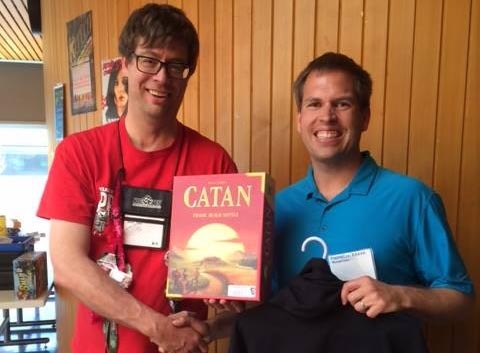 Congratulations to Michael From, winner of the Catan Canadian National Championship at PrairieCon! Michael will be representing Canada at the Catan World Championship’s in September. Big thanks to everyone who played and to our finalists (right to left: Emily Johnson, Michael From, [Organizer], Cheryl Fines and Paul Dueck). We are pleased to have hosted such a highly competitive and rewarding tournament in our 37th year and we’re looking forward to doing so again!